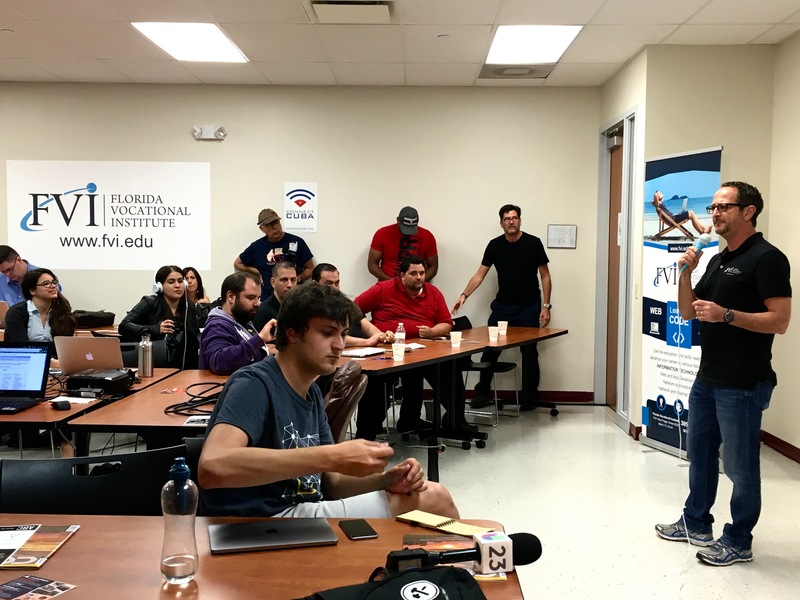 It was an exciting weekend at Florida Vocational Institute, as a Cuban coder on the island won the top prize at the HeyCuba Hackathon at its Miami campus. The runner up coder was a Miami team that created a workaround for Google that used the non-profit Apretaste platform. FVI had more than 100 coders who competed to expand Cuba’s Internet access using workarounds created on the spot. The inaugural HeyCuba Hackathon, which ran from March 11-13 at the FVI campus at Mall of the Americas, came two days after the White House named Miami-Dade County a TechHire community. The HeyCuba Hackathon first place winner was a coder in Cuba, who identifies himself as ‘Kuma’ in fear of the Cuban government finding out his real name and efforts to expand Cuba’s Internet access through coding. For the Hackathon, Kuma created an app called NAVEGAR, which now allows Cubans to access and browse any website, just as any mainstream web browser. Instructors from FVI, which offers short and long-term coding training, were on hand at the HeyCuba event to help novices, as well as those with the coding chops to pry open Cuba’s Internet. Participants had access to FVI computers and its network at the campus. Florida Vocational Institute’s mission is to offer affordable training and employable skills in the challenging and rewarding information technology and healthcare career fields. It achieves this mission through the leadership of a team that possesses decades of experience in career training. In addition to training, FVI dedicates its time to helping students obtain financial aid and has a strong track record of placing graduates in IT jobs. Girnun is also Co-Chair of the TechHire.Miami initiative, which pushed to get Miami-Dade County named a TechHire community. The TechHire.Miami group, a consortium of more than 100 companies and organizations, is ultimately focused on winning $100 million in TechHire-related grants from the Department of Labor for apprenticeships and educational opportunities that lead to great IT jobs. Currently, more than 35,000 Cubans have access to email, but can’t browse the Internet freely. Cuban immigrant Salvi Pascual founded Miami-based Apretaste as a workaround that uses email as the go-between for queries. To that end, the user on the island sends a question by email with their topic of interest like “Wikipedia”, followed by specific keywords, and gets back an automatic response that in a few steps provides the specific information. Girnun explained that Cubans living on the island today might be learning code in Miami in the very near future.